It's lots of fun to go fretless! I've been playing around with the fretless guitar concept for the past three years or so, and I thought now is as good a time as any to show you what I've been up to. It's a single slab of ziricote, with a thin single-coil pickup. Played with flatwound strings and a very low action, you can get a great zinging tone, similar to that of a good fretless electric bass, only higher. When you're fretless you also don't need to worry about having an intonation-adjustable bridge, so a simple slice of bone suffices. Pros of this guitar are that it's light, handy, and looks really cool. It even fits, with a volume pedal, inside a mic-strand case. 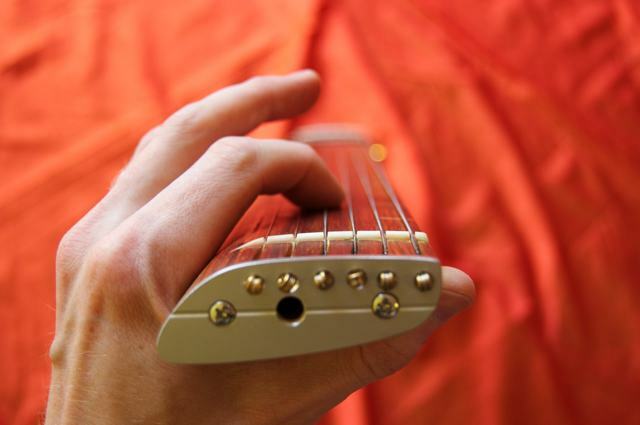 Cons: it's very difficult to play without fret markers, and the lack of body means that it's hard to control the neck, and thus hard to place the hand accurately. I used it for a couple of gigs, but then decided to go back to the lab. You can also see another model on the background, made to test the tuner locations. 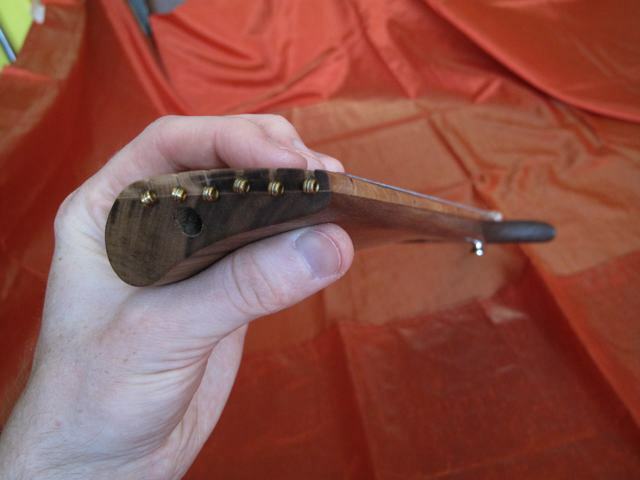 Since the hand rotates as it travels up the neck, I shaped the high register to a different profile. Note the concavity for the thumb. It has good stiffness because of the depth, but having a deep concavity mimics having a very thin neck. You can also see that the strings are not marked along the centreline; they taper like a normal neck, but only towards the bass side. Thus the neck blank is made from a slab of wood roughly 3" wide all along it's length. Exciting stuff! I couldn't wait to make another playable prototype utilizing this concept. For the next go, I used a 1" slab of cocobolo rosewood. In keeping with the minimalist theme, I wanted to avoid gluing pieces together, which meant that the whole guitar is made from wood tough enough to serve as a fretless fingerboard. It certainly is eye-catching. The move to inline tuners (lefthanded, so they turn the correct way) helped with the tuning stability (though again, with fretless guitars that isn't too much of a problem), and the Lace Alumitone pickup allowed plenty of wood behind it for stiffness. Unfortunately, due to a slight modification for this installation, I broke one of the fine magnet wires, and rather than undo everything and try to repair it, I just used the guitar unplugged. As you can see, I discovered that hyperminimalism was not realistic in terms of guitar design. And since reality trumps ideology, it has sprouted small wings. The little one at the bottom is just enough to allow it to be played on the lap, and the upper one is meant to keep the strap button out of the way, as well as to support the right wrist. This one is made of black walnut about 1.25" thick, with a spectacular fingerboard of figured hop-hornbeam courtesy of luthier Marc Saumier. As you can see I decide to go with full fret markers this time- it even has side dots. I also pulled the alumitone pickup off the cocobolo prototype, repaired it, and used it here. Terrific sound, lightweight, and dead quiet in operation; I'll be using these again for sure. It's a major improvement over the last one. After testing it out with a few players, I've learned that the size and shape of the hand support section is quite dependent on the player. Some people found it "just right"; personally, I've got pretty long fingers so I felt like I could have used even a little extra meat. Also, I found that one starts to use some different muscles to play this way. It isn't bad, but I felt some more tiredness in my hands after playing at first. That seemed to go away pretty quickly though- much like adapting to any new guitar. On regular guitars I'm a big fan of zero frets. 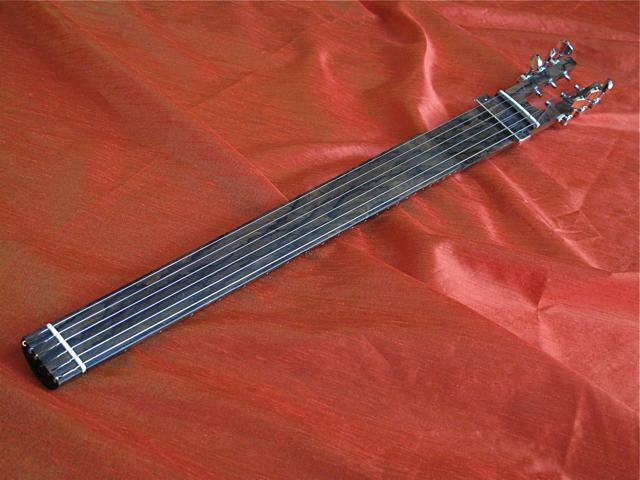 They enable open strings to have just about the same tone and action as fretted ones. 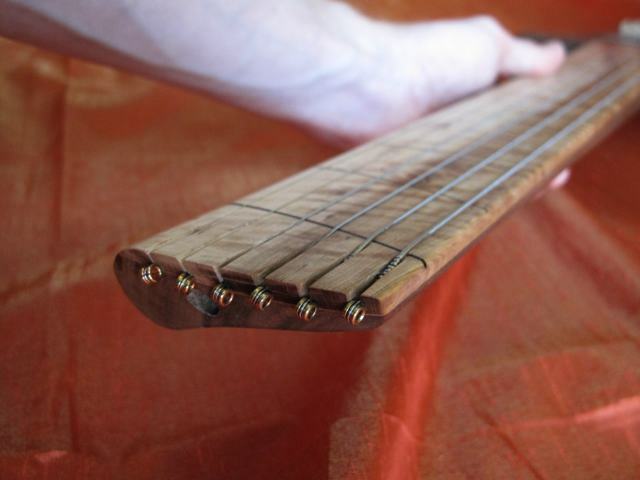 But how would you do that on a fretless guitar? With a zero-fret marker. The strings rest in slots that are too narrow for the ball ends, and the slots are cut to end precisely at the marker, no harware required. 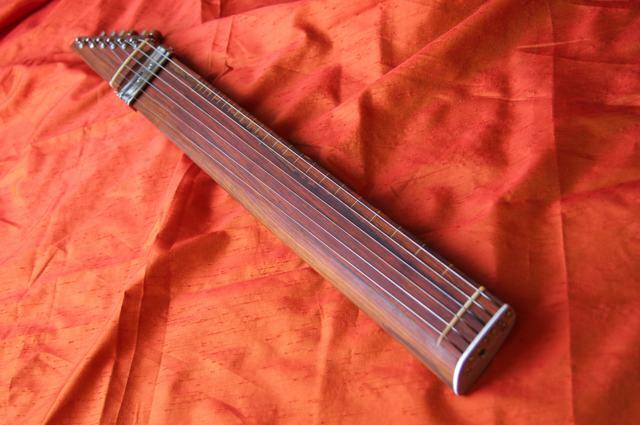 So you can get the same mild fretboard buzz that's so much a part of the fretless sound, even on open strings. As a bonus, you can even glissando from open into any position. Last of all, the bridge. This is probably not going to get developed further because the strings don't slide smoothly when tuning, but at the time I thought it was a simple and elegant solution. 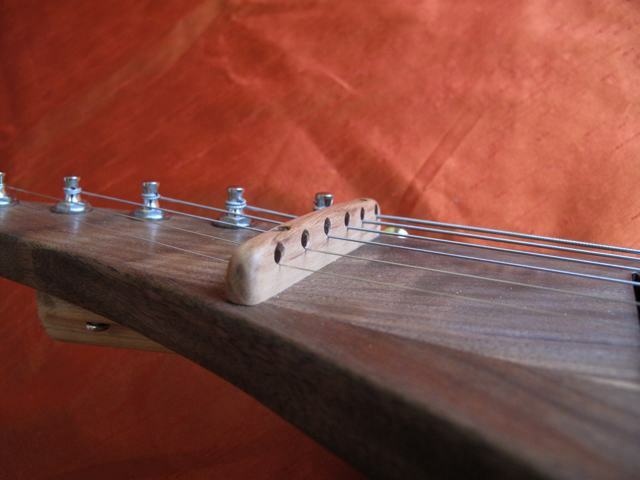 The string needs to have enough downward pressure at the bridge so the endoint is defined, but if you've got tuners that are the same level as the string, you'd normally have to use two pieces- a bridge to define the endpoint, and a bar to provide downpressure. By drilling holes for the strings (accurately following the radius of the fretboard) at an angle, I can do this with with one element. 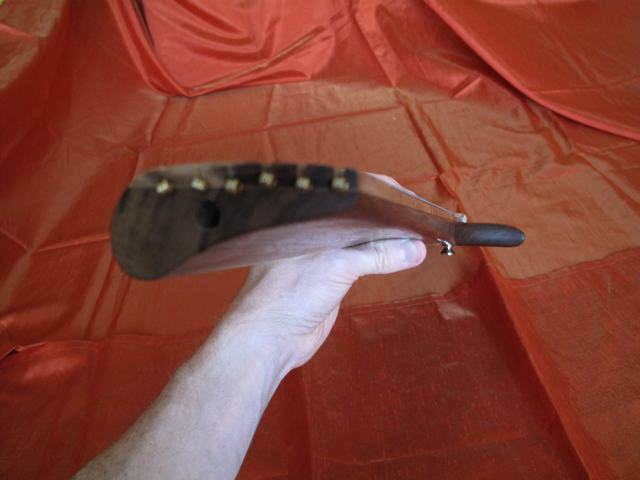 Again, the nature of a fretless guitar allows simplification- I don't need to have adjustable intonation, and the string height can be "set and forget" by simply using a couple of shims under the bridge attachment screws. I've enjoyed playing this one- hopefully I'll have some sound samples posted here soon. But it is not yet perfected; I'm going to keep working on this airfoil-shaped neck idea, coupled with the headless, minimal guitar idea some more. What do you think so far?